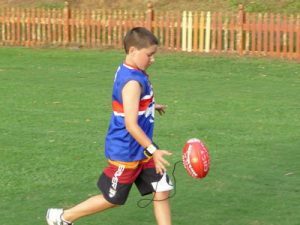 Inflation Instructions: Mark Master Footballs, AFL Training BallsWhen inflating the Mark Master AFL Footballs Size 2, 3,4 and 5. You will require a minimum 36mm long needle. A shorter needle will Not inflate these AFL training balls. When inflating the Pass Master Footballs for Gridiron, Soccer & Rugby you can use any length inflation needle. The needle needs to be lubricated and pushed firmly into the valve (you may feel some resistance, but you need to penetrate the seal). Once through the seal the valve will open and you can start pumping the air into the ball. All training footballs have a Wrist Band. If you KICK using your RIGHT foot , then the wrist band is placed on the RIGHT WRIST. If you KICK using your LEFT foot, then the wrist band is placed on the LEFT WRIST, its that easy. When the ball is kicked, the ball returns to the player. Do the wrist band up firmly, placing with the swivel and bungy cord on the INSIDE of the wrist. IMPORTANT: Things Not To Do with the training ball. Spinning the training balls around and around (like a helicopter). This will stress the bungee cord and the cord will break where it comes out of the ball. Young kids love doing this. There is no warranty against this action. 2. Kicking a ball at short range at another person. 3. Do not allow the bungee cord to be wrapped around the body or head. 4. The training ball is a training device and Not a Toy, when used correctly, it will last a very long time.